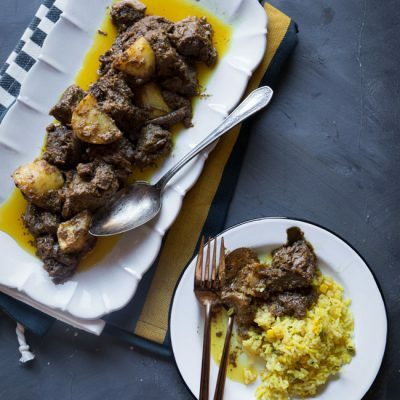 Learn how to make the real deal Indonesian beef rendang Padang from scratch. 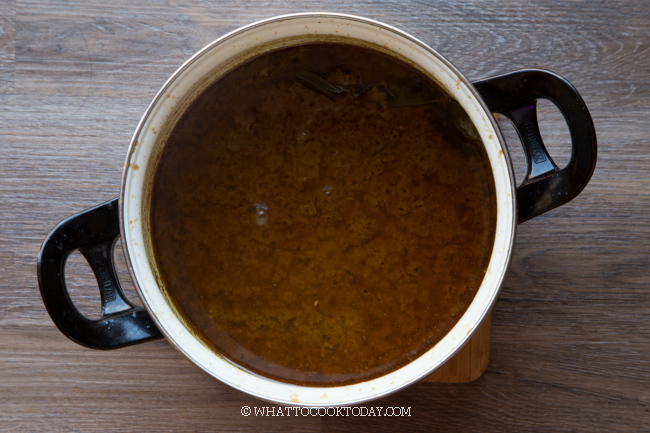 All the tips you need to replicate this on the stove or with a pressure cooker. You don’t know delicious until you taste authentic rendang Padang. I’m not even kidding! Rendang is one of my most favorite Indonesian dishes. It is one of Indonesia’s National Dishes. I remember eating rendang Padang with sweat streaming down my face but yet I couldn’t stop because it’s so addicting. The rendang sauce with the rice is so freaking good! Rendang is originated from the Minangkabau ethnic group in the city of Padang in West Sumatra, Indonesia. It is sometimes known as Randang in Minang dialect. Padang food is known to be one of the most popular in Indonesia, known for its rich taste and incredible flavor. Rendang Padang is one of the super popular ones across Indonesia or even in Southeast Asia or worldwide these days. Just scroll down and take a look at the list of the spices, herbs, and other ingredients and you will understand why it tastes so damn good! The coconut cream is also what makes rendang Padang tasted incredible. It is such a complex flavor that it’s hard to describe. It’s a loongggg list of ingredients, but I can assure you, it’s worth it!! 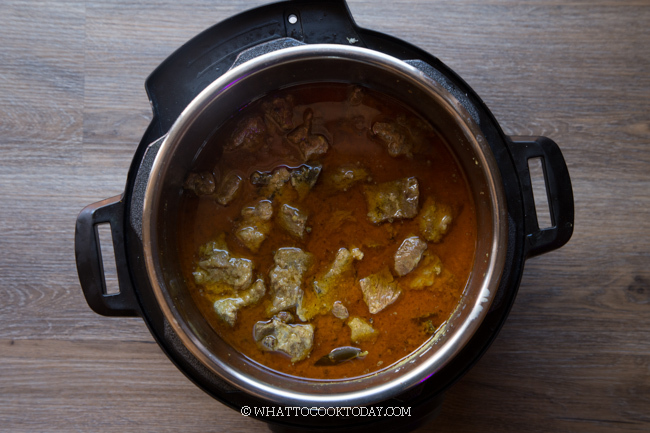 Traditional beef rendang is also known as the dry rendang. Back in the old days before refrigerator is common, the method of cooking rendang calls “merendang” (slow cooking) is actually to preserve the meat longer. 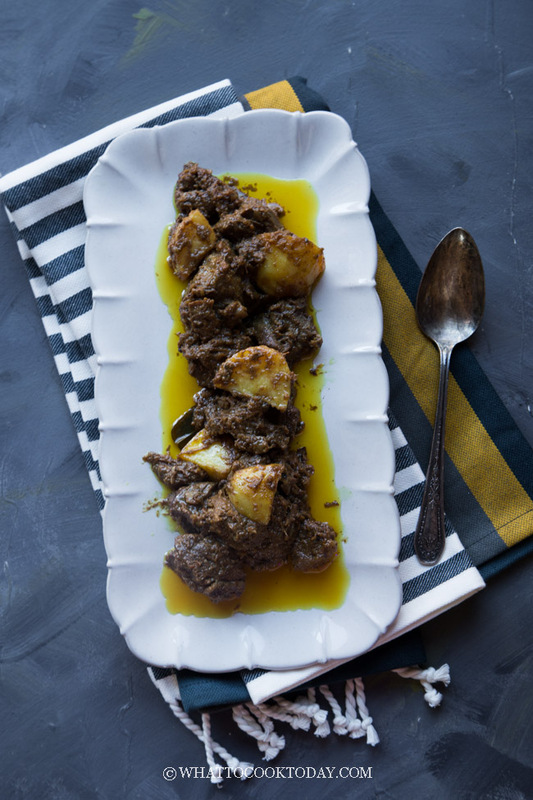 Rendang is cooked in lots of spices, herbs, and coconut cream. 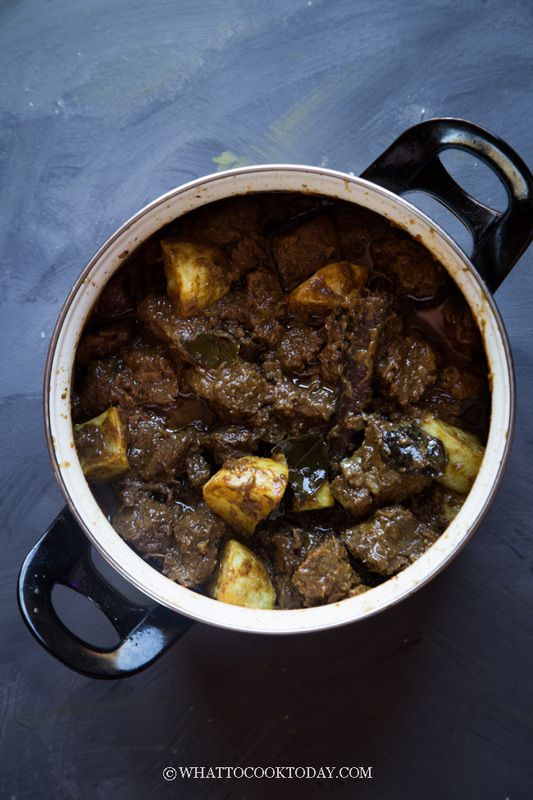 As the beef is slowly cooked until tender, it will ooze out the liquid, this liquid is continuously cooked until it evaporates and the oil from the coconut cream separates. The oil will then gently fry the meat. No more liquid in the dish means it can last longer without spoiling and the oil that separates will help to preserve the meat longer too. 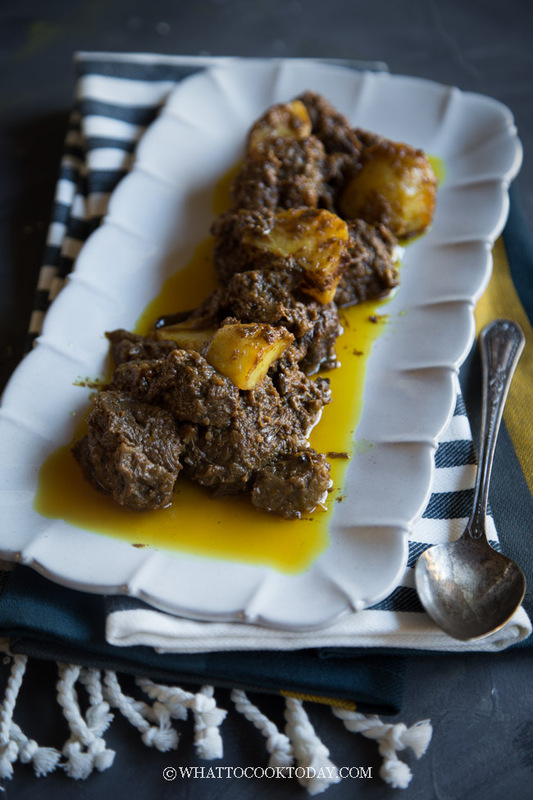 Traditional rendang Padang is dark in color. The spices, the coconut cream and everything else in there will gradually change color as you cook the rendang. Yes, that’s one of the key signatures of rendang. 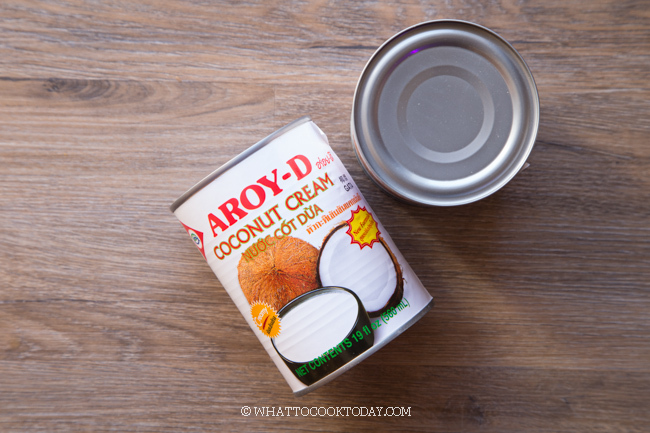 The oil that separates from the coconut cream helps to preserve rendang and also adds an incredible flavor to the dish. It tastes as good as I can remember it when I had it as a kid. 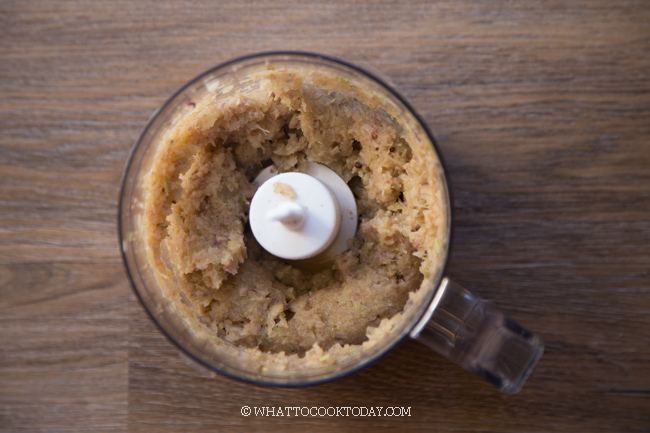 I simplify the recipe by using some ground spices, which are widely available these days, but I can assure you that the end result still tastes amazing. Traditionally the beef is boiled for hours until tender. I only need 30 minutes to pressure cook the beef until it’s tender. I love pressured cooked meat because it’s tender in less amount of time. Why in the world do I want to do that you would ask! Wouldn’t it be more convenient to reduce the sauce right there in the Instant Pot. I tried! While it’s possible to do this, it really creates a mess. I can’t control the level of heat on the saute mode in Instant pot, which means, the rendang is continuously boiling at possibly high heat and the sauce keep splattering all over. I finally decided to transfer the rendang to a regular pot and reduce it over low to medium heat. It works great! Beef is tender in half the time and less mess. Look how thick the coconut cream is. The bottom part is more watery. 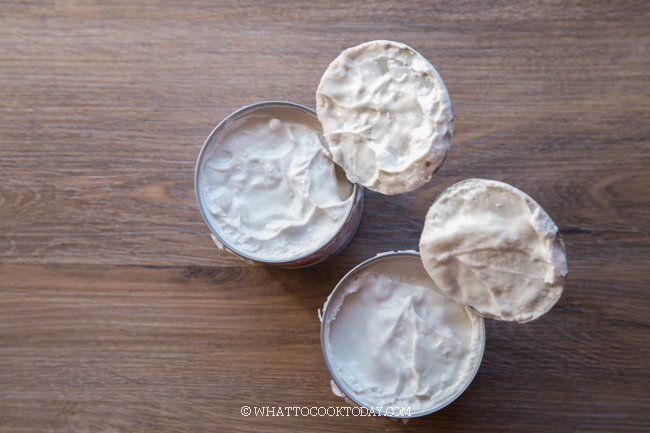 I usually use a spoon to carefully spoon the cream out and leave the watery part for other use. The more concentrated the coconut cream, the better because you won’t have as much liquid to boil off later while reducing the rendang. My favorite is with the combination of chuck and shank. 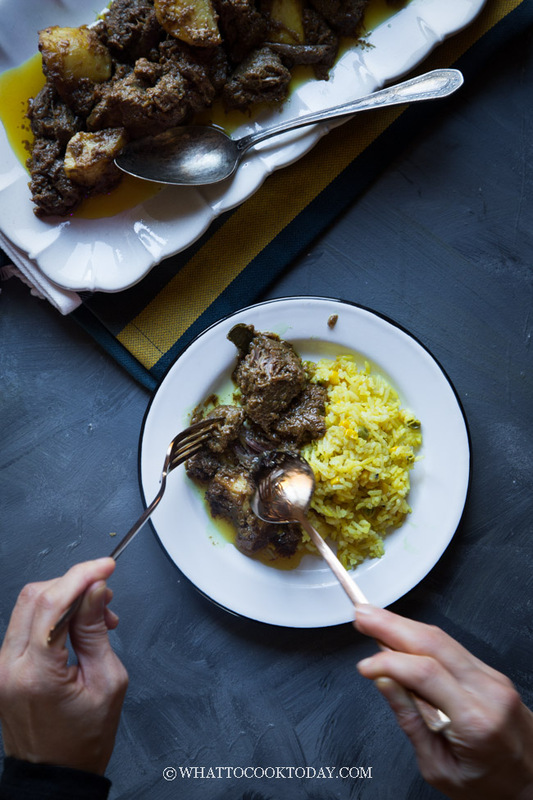 Traditionally the rendang Padang doesn’t usually include shank. But the shank is so good after it is pressure cooked to tender. You can also make it with just chuck. Chuck is perfect for long cooking. It’s a personal preference, but I don’t like rendang made with sirloin, but that’s just me. The toasted unsweetened grated coconut adds another layer of flavor to the rendang Padang. You might think this rendang Padang might end up tasting like a bit pot of coconut, but let me tell you it’s not. 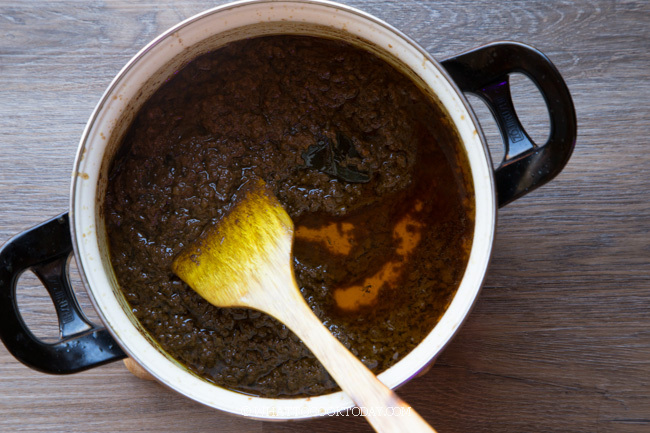 Everything used in to make the rendang just comes together beautifully to give you such a complex rich flavor and taste. This is important in most Indonesian cooking. Most ground spices and herbs are usually sauteed until really fragrant and darken in color. This step will amplify the flavor of the dish. I remove the beef after pressure cooking and transfer the rest to a pot and let it slowly simmer until all liquid evaporates and the oil separates. How dry you want it to be is really up to you. Authentic rendang Padang is really dry, but if you like it more moist with a bit more sauce, you don’t have to reduce as long. I used air-fried potatoes instead of deep-fried potatoes. Frying the potatoes first will ensure that the potatoes hold their shapes and won’t turn into mush in the rendang. 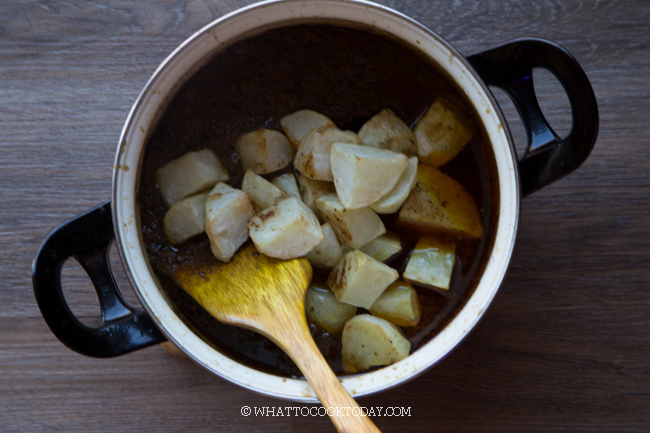 Add the potatoes in and stir to mix everything. 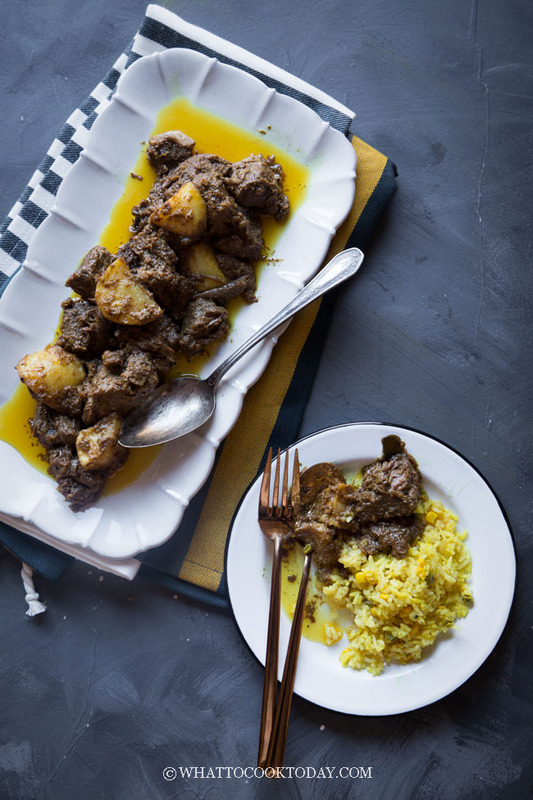 Learn how to make the real deal Indonesian beef rendang Padang from scratch. 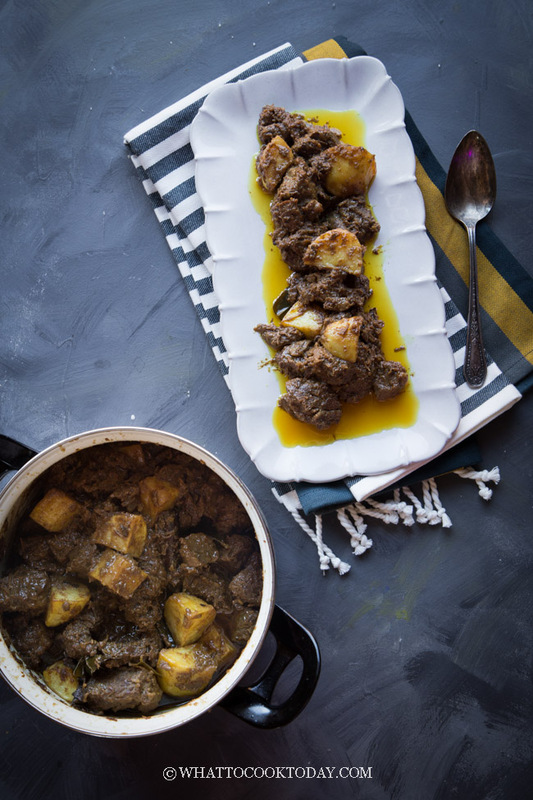 This recipe will be your go-to beef rendang Padang! All the tips you need to replicate this successfully at home on the stove or with pressure cooker. Press saute on instant pot. When it's hot, add coconut oil/cooking oil. Add the ground spices and stir fry until really fragrant, about 5 minutes. Add the rest of the herbs and spices. Use a wooden spatula to scrape the bottom of the pot if necessary. 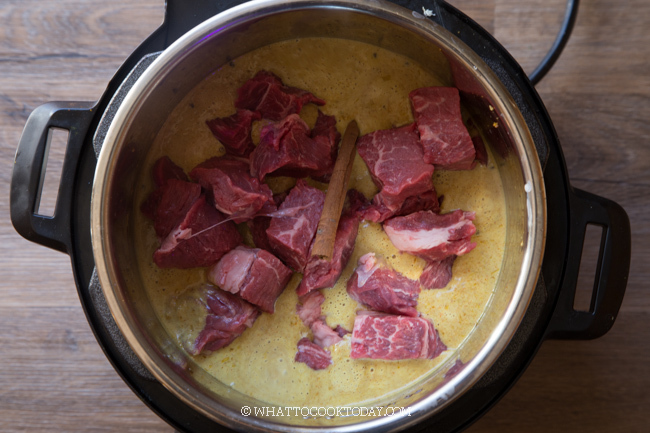 I personally think the best cut of beef to use for beef rendang is beef shank/beef shin because it has a mixture of tendon and meat and when you cook them long enough (or pressure cooked), it gives you that melt-in-your-mouth texture. But shank is not always available and that's when I use chuck, which works really well too. This dish looks absolutely mouthwatering. I can just taste the tender beef! This looks so delicious.I saw your blog from the foodie blog roll and I like what you have here.if you won’t mind I’d love to guide Foodista readers to this post.Just add the foodista widget to the end of this post and it’s all set, Thanks! A very delicious dish! I love beef rendang! I’ve been looking for days through tons of sources for appealing beef recipes for a potential client who wants beef. I was about to decide that I was more on the vegetarian side until I thought of going to your site. It was like an aha moment; I love what I see so far! Love keeping up with you! Hi!! What kind of beef do you use? Stew meat and top round just doesn’t work for me! It doesn’t come out stringy like its supposed to… Or does it become stringy dePending On how it’s cooked? Hi Yuwie, Sorry I forgot to include what type of beef, I’ve updated the recipe. Try shank, chuck or rump. I’ve used shank and chuck before, but I heard rump will work as well. Leaner cut is what makes it “stringy” I supposed. Thank you! It is definitely not flank steak nor sirloin! Is it necessary to use tumeric leaf? Is there a substitute for this? What is the indonesian name for this? I Just looooooove all your recipes !!! Thanks to your recipes i CAN enjoy food again and The bonus point ….home made !!!! Your recipes are The best !!!! After living in The uk for 23 years , Where indonesian or Asian thing is a normal thing , i moved to France Where it is non existant or really really bad ! Thanks to You we can cook amazing dishes and best of all , home made !!! Great recipe you sharing with you. I am very thankful to you.. I dont have a pressure cooker or instant pot- how can I cook in regular pot on stove? Hi Tricia, I’ve updated the recipe to make the rendang on regular pot on the stove. I hope that helps! 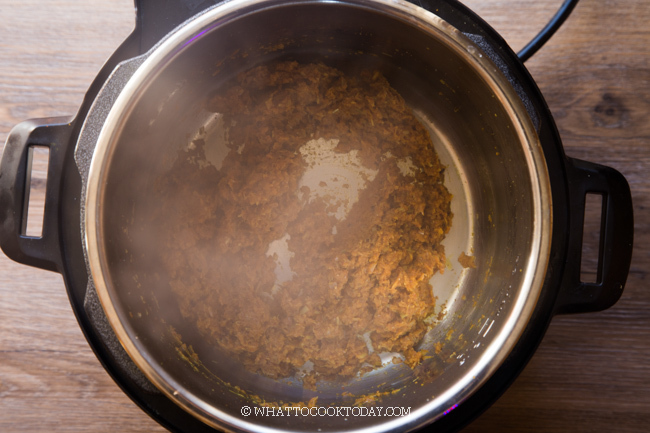 I always wondered if I could make rendang in instant pot as I rarely use it and it would be nice to be able to leave the rendang cooking without me checking every now and then. 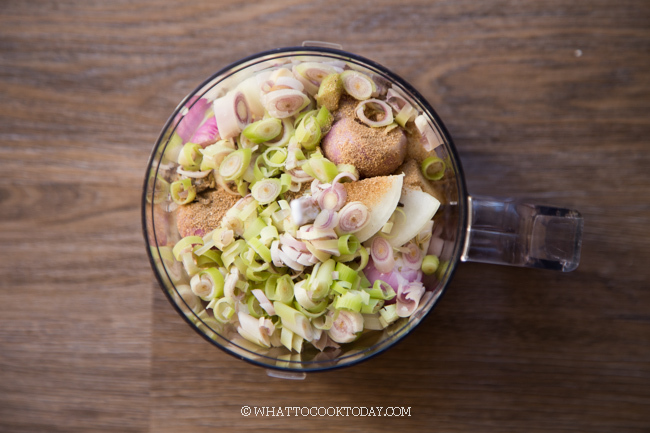 Have you tried using the slow cook setting? You probably have to open the vent or use a pot lid instead. I want to try it over the weekend, I hope it would work. I have yet to try the slow cook setting but from what I heard and read, people highly suggest using a glass lid and to open the vent all the way for slow cooking. IP sells the glass lid I think, or if you have one that fits the IP should work too. Let me know how it turns out with IP slow cooker. This is one of the features of IP I have yet to try. I always use IP for pressure cooking LOL! I learned to make rendang from scratch in 1979 from the Ibu in a house I lived in, in a small village outside Bukit Tinggi, called Pandai Sikek. I have her recipe somewhere, but from what I read here this one is pretty accurate; IU’d go ionto the garden and pick the lime leaves, the curry leaves (NOT bay leaves as you mention here–flavour is quite different), the chillies, etc. I’d make the sambal fresh grinding the chillis, salt and bawang merah (shallots) by hand on a stone. I also used to make the coconut mil fresh by grinding the coconut flesh down on a serrated tool that people used to use to make homemade santan. I seem to remember she used both thick and thin coconut milk in equal parts. I’ll add the following to your instructions: after the minyak (oil) separates from the santan (coconut milk) if you want top-notch rendang it’s important that you stir the rendang gently but constantly while if slowly fries in the reduced sauce, this make take an hour or two. Indonesian food is the most sophisticated cuisine on the planet, the flavours are extremely complex and layered; and Padang cooking is the most sophisticated and complex (and tasty) of Indonesian cuisines. Rendang is the best thing I have ever eaten in my life, and I love it as much after 40 years as the first day I tasted it. I wish I could post the pics here that I have of my Ibu’s rendang! Thank you so much for sharing David! I can literally taste what you describe here! Love the tips you are sharing too. I have to agree that Rendang is truly one of the best things on planet earth! Take some efforts to make, BUT so worth it!